We use the most popular social networks like Facebook, YouTube, Instagram, Twitter, Pinterest, LinkedIn & Google+ to reach out to the maximum and most relevant audience by targeting demographics, interests, job titles, behaviors, keywords, etc. to sell our B2C or B2B products & services. Our digital marketing process starts with analyzing the website or the app and then optimizing it for best performance by following the standardized guidelines and also creating the necessary landing pages. This is followed by creating content in the form of blogs, infographics, whitepapers, etc. that would appeal & generate traffic on the website. Then the three main components of inbound marketing come into play i.e. 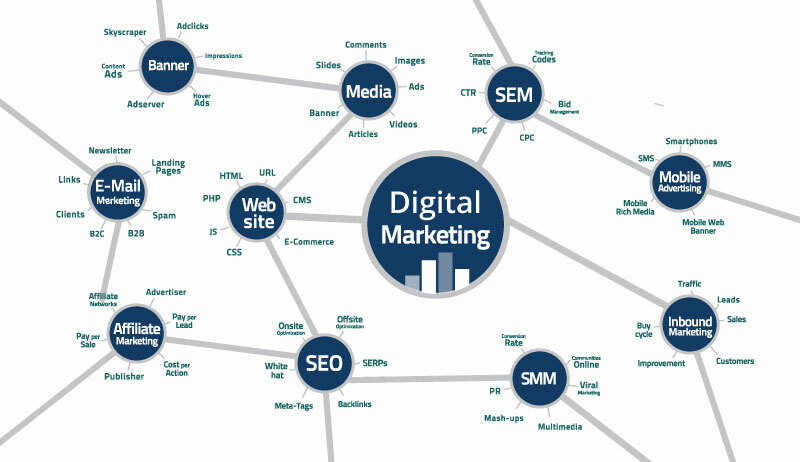 SMM, SEM & SEO to make the products and services available to the mass audiences via paid & non-paid channels. We will provide your brand with fresh & engaging content by creating social media marketing (SMM) strategies that will work round the clock for your business while keeping in mind the latest trends. We will perform search engine marketing/online advertising via Google AdWords, Facebook Adverts, Twitter Ads, LinkedIn Promotions and other Mediums using the PPC or PPM model that best suits your business objectives. We will perform on-page content editing activities & off-page white-hat link building activities as part of our Search Engine Optimization strategy for your website and bring its organic ranking to the top of the SERPs. We keep our writing procedure simple. Just give us a brief & our team of professional writers will create rich content that you need for your brand which will drive traffic to your business & improve your websites organic ranking. Creating the right landing page is no rocket science, it just requires knack & presence of mind – We’ve got a bandwidth that has the above two qualities to create the best performing page for your products & services.